Hoons attack Melbourne Naval monument – Alternate Comms. Photo taken: Saturday 30 August 2008 at 11.30am, Swanston Street, Melbourne, Victoria, Australia. 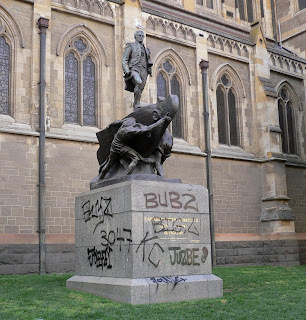 A prominent Melbourne city monument, the Matthew Flinders statue, has been vandalised late last week right under the noses of Victoria Police. The statue is situated outside St Paul’s Cathedral on Swanston Street and around just around the corner is a Victoria Police station in Flinders Lane. Matthew Flinders was a famous British naval explorer (1774-1814) who became the first European to circumnavigate Australia in 1803. The vandals left a possible calling card or clue by daubing the figure “3047” a possible reference to a suburb in Melbourne, which is Broadmeadows ! Photo is copyright Sasha Uzunov 2008.